Defense lawyers in journalist’s murder case appeal verdict | Russian Legal Information Agency (RAPSI). MOSCOW, May 11 – RAPSI. The lawyers of Nikita Tikhonov and Yevgenia Khasis, who were convicted in the daytime slaying of lawyer Stanislav Markelov and journalist Anastasia Baburova, have appealed the verdict in the Supreme Court, defense lawyer Gennady Nebritov told RIA Novosti. The court sentenced Tikhonov to life imprisonment. Khasis was given 18 years behind bars. Nebritov said he filed a brief appeal, which would be followed by a complete appeal at a later point. Lawyer Vladimir Zherebenkov, who represents the plaintiffs in the case, told the Russian Legal Information Agency (RAPSI) that the appeal might be considered by the Supreme Court in late summer based on existing practice. He questioned the validity of the appeal and the prospects of it being upheld by the court. 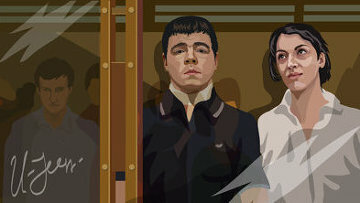 Markelov and Baburova were shot dead in Moscow on Jan. 19, 2009. Tikhonov and Khasis were convicted by a majority jury vote of murdering Markelov and illicit arms trafficking. Tikhonov was also found guilty of murdering Baburova and using forged documents. 18:25 11/05/2011 The lawyers of Nikita Tikhonov and Yevgenia Khasis, who were convicted in the daytime slaying of lawyer Stanislav Markelov and journalist Anastasia Baburova, have appealed the verdict in the Supreme Court, defense lawyer Gennady Nebritov told.